We didn’t think it was possible to do many new and fascinating things with batteries, but inventors Trey Madhyastha and Kellan O’Connor have proven us wrong. They are the creators of Tethercell, a Bluetooth-enabled device that gives you total remote control over your battery-powered objects. 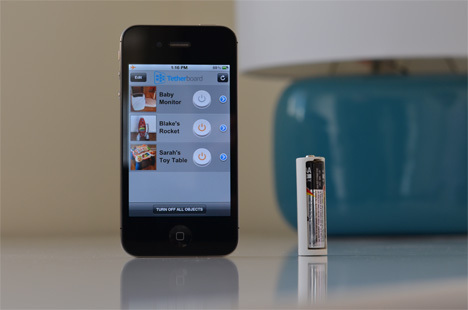 The Tethercell works in devices that take AA batteries. It is a small contraption that fits in the battery compartment around a AAA battery. With an iOS app running on a Bluetooth-enabled mobile device, you can use the Tethercell to turn the power to those devices off and on – as long as you’re within 100 feet of them. 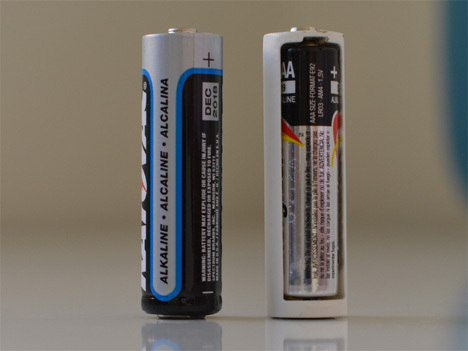 All it takes is replacing one of the device’s AA batteries with a single Tethercell-equipped AAA battery. No matter how many batteries the device has, only one needs to be replaced with a Tethercell. 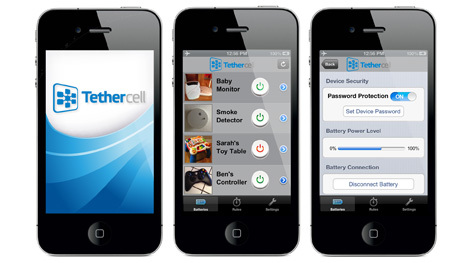 The Tethercell is then detected by the app and you choose a secure password for it. From that point on, whenever you want to turn the device off to conserve energy, limit play time with electronics or just get that annoying talking toy to shut up, you just have to turn off the Tethercell via the mobile app. The project is raising money for an initial production run on Indiegogo, where a minimum pledge of $35 (US) gets you your very own. See more in Industrial Design or under Technology. February, 2013.